Erin Wasiak, co-president of the Henry Parent-Teacher Association, speaks at a public hearing on elementary school boundaries. (Updated at 9:50 a.m.) Many parents of Patrick Henry Elementary School students have expected, for years, that their community would move as one to Alice West Fleet Elementary when it opens next fall. They believe Arlington school officials have repeatedly promised them as much over the years, as deliberations have progressed over the best way to build a new South Arlington elementary school, then shift Drew Model School’s Montessori program to Henry’s old building. That’s why so many Henry parents are now furious that Superintendent Patrick Murphy’s proposal for a redrawing of school boundaries would send more than a fifth of current Henry students to schools other than Fleet. School leaders, however, argue they’ve never made such promises about keeping the entirety of the Henry community together. The current boundary process is aimed at better spreading out students across eight different South Arlington elementary schools, and officials argue that it’s likely impossible they’ll be able to please every single parent as they look toward the greater good for the whole school system. But some parents believe there’s a better way to achieve school officials’ stated goals for the boundary process, which simply involves a little bit of creative thinking. They’d much rather see the school system transform Drew into a science and technology-focused program that accepts transfers from across the county, as a way of simultaneously solving overcrowding issues in the area and avoiding a major breach of trust with the community. 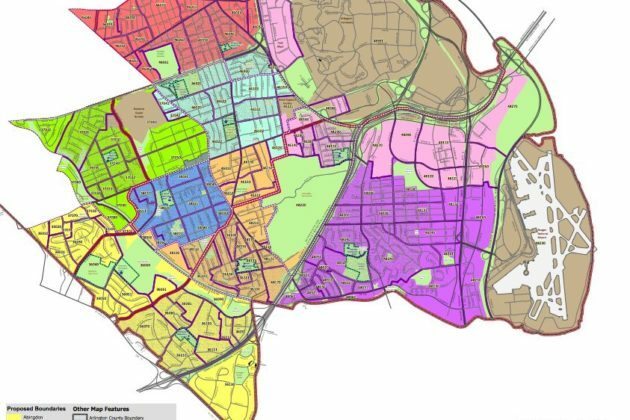 After releasing a slightly revised version of Murphy’s map and holding a public hearing on the boundary proposals last night (Tuesday), the School Board won’t approve a final map until Dec. 6. Some early proposals would’ve moved all but a small section of the Henry community to Fleet, though some came at the cost of angering parents in Fairlington by moving students from Abingdon to Drew, and Board members stress that all of the draft maps remain on the table for debate. 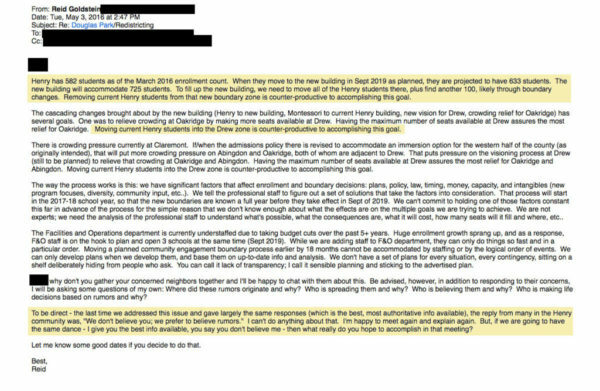 Yet Arlington Public Schools spokesman Frank Bellavia insists that moving Henry to Fleet was merely a “general plan” developed as the school system began planning for a new elementary school in 2013, and never an explicit promise. “When APS began this boundary process, the School Board listed eight schools to be included in this process and none were to be exempt from possible boundary changes,” Bellavia said. School Board Chair Reid Goldstein was even more emphatic during an Oct. 24 work session, arguing that parents were mistaken in assuming that Henry’s student body would move together to Fleet. He even conceded that some school officials, himself included, might have given parents the wrong impression about the matter, and should’ve expressed more uncertainty about the future. Goldstein went on to explain that he’d requested a correction to an ARLnow article which reported on APS officials reassuring Henry parents that all students would move to Fleet, after several parents mentioned such assurances at an October School Board meeting. He argued that the article was “inaccurate” and “further inflamed” tensions over the matter. 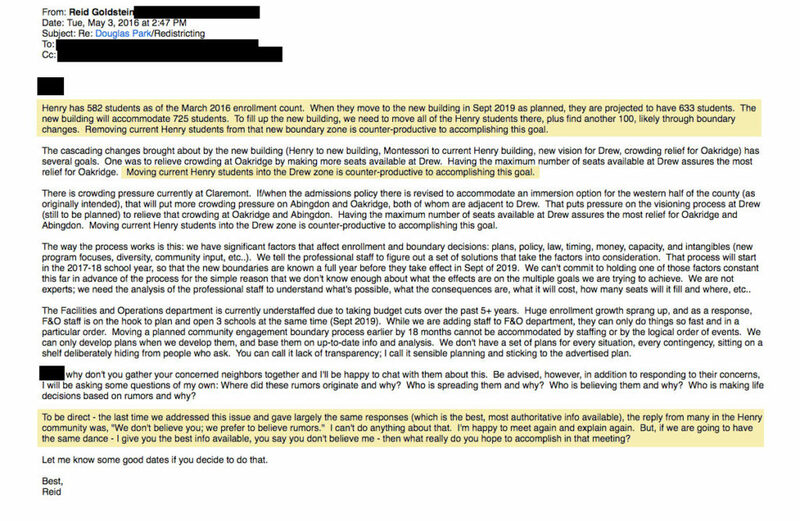 And, in a May 2016 email to Douglas Park Civic Association leaders obtained by ARLnow, Goldstein himself looks to quell what he dubs “rumors” that the Henry community will be split up in the move to Fleet. 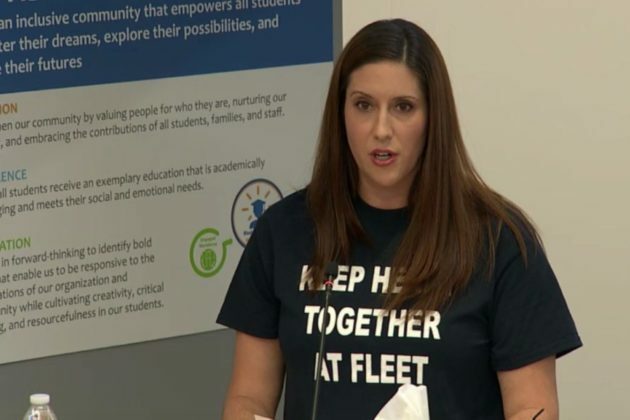 Megan Haydasz, the chair of the Fleet BLPC and another Henry parent, remembers receiving similar assurances from school officials and Board members alike. She recalls hearing that Fleet would be built large enough to accommodate both the entirety of the Henry community and other South Arlington students, which eased plenty of minds as the Fleet design process advanced. “We’re taking a school and moving it to place with less acreage, but we made that tradeoff because we thought we could keep the community together,” Haydasz said. Beyond any promises that the school system did or did not make, Haydasz and her fellow Henry parents are concerned that splitting up students would break up an academically thriving school — Henry received a designation as a “National Blue Ribbon” school for its academic performance in 2015, one of just 11 in the state to earn the recognition. Additionally, the school has one of the more diverse student bodies in the county — as of 2017, Henry had the 11th highest non-white population of students of Arlington’s 23 elementary schools — and parents fear losing some of that diversity under the proposed boundary changes. Murphy’s proposal would indeed move some kids living south of the Pike to Drew, though APS projections suggest that Fleet’s percentage of students eligible for free and reduced lunch — a key indicator of a family’s economic means — wouldn’t look substantially different from Henry’s FRL rate under the boundary changes. However, the Henry parents think they’ve found a way to simultaneously avoid any breakup of the community and help Drew thrive. Parents at Drew have been similarly frustrated with the boundary process, with some worrying that the changes will leave the school with too large a concentration of students from low-income families. Murphy’s recommendation would reduce the school’s FRL rate slightly from prior boundary proposals, but leave it among the higher rates in the county. That’s why Christine Brittle, a parent of two Henry students, crunched the numbers and came up with a proposal to transform Drew into a countywide program aimed at solving all of the aforementioned issues. Brittle found that the eight South Arlington schools included in the boundary process have an unusually high number of students who transfer elsewhere — Drew, for instance, had the sixth highest transfer rate in the county last year. She suspects that’s driven by wealthier families who go in search of countywide “choice” programs, leaving the South Arlington schools with more lopsided demographic mixes and suggesting there’s clear demand for more option programs in the area. Brittle proposes building on Drew’s existing program focusing on science, technology, engineering, art and math — known by the acronym “STEAM” — to make such a change. She envisions Drew still having neighborhood boundaries, but accepting students from all over the county to build a different kind of community there. She expects the change would mean the county could fill Drew without diverting as many students away from Henry, satisfying her fellow parents, and she says she’s already heard broad support from parents at all manner of schools for the idea. Brittle even brought it to both Drew’s principal and the head of its parent-teacher association and she says both were open to the idea — PTA president Melissa Thierry did not respond to a request for comment. Brittle says she also presented the idea to all five Board members, though none of them responded to questions about the proposal posed to a Board spokeswoman. It’s that sort of response that Everling says has caused him to lose most of his faith in the school system before the process is even officially over. After his experience working on the issue over the last few years, he hopes that parents at the 14 schools set to have their boundaries redrawn in 2020 sit up and take notice. “Listen up, because these people will lay out a process and then change it at the last minute,” Everling said.